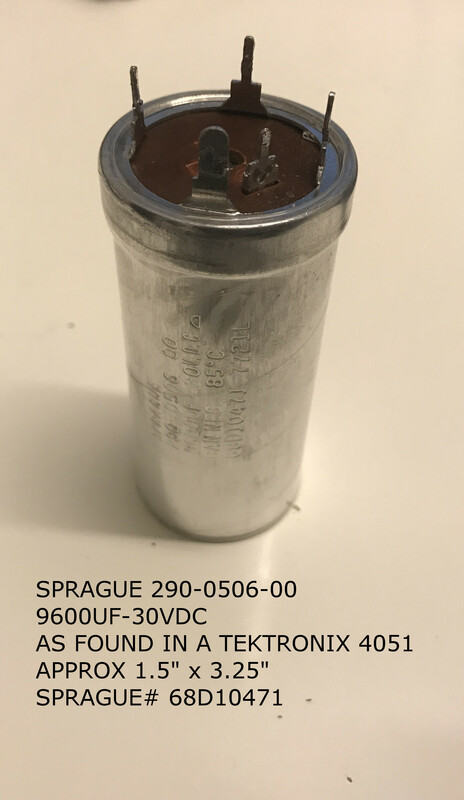 SPRAGUE capacitor for Tektronix 4051. Previous message: SPRAGUE capacitor for Tektronix 4051. Next message: SPRAGUE capacitor for Tektronix 4051. > One of the DC filter capacitors has gone open circuit in my Tektronix 4051. > It is a SPRAGUE 9600 uF - 30VDC with a little bit unusual foot print. > It might be common for other Tek equipment. > Google turned up one Ebay-hit for a completed auction but that's it. That's fairly conventional PCB mounted electrolytic. Do you need it PCB mounted? Does it need all those legs to keep it in place? A search on Digikey turns up hundreds of can type electrolytics, about 300 in the 30-50V range at 10,000 uF. I looked for "snap in", they look pretty similar though the precise footprint is not quite the same. Or you might use one with wires, and bend them to fit the existing holes.